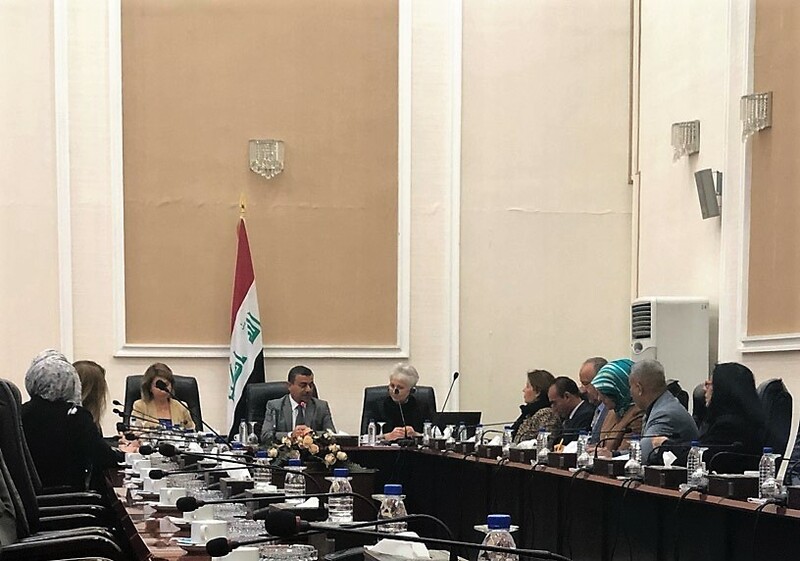 The meeting of the Country Advisory Committee of the project “Strengthening access to protection, participation and services for women refugees, IDPs and host communities in Lebanon, Iraq and Jordan”, funded by The European Union Regional Trust Fund in Response to the Syrian Crisis, the “EU MADAD Fund", took place on the 17 December 2018 at Council of Ministers, Baghdad, chaired by H.E. Dr. Mahdi Al Alak, Secretary General of the Council of Ministers. It was organized by EuroMed Feminist Initiative and the consortium members in Iraq/KR-I, Baghdad Women Association (BWA) and the Women Empowerment Organization (WEO). It followed the conference presenting the national report of the implementation of Iraq national action plan on UNSCR 1325 on women, peace and security, held on 16th December 2018 under the patronage of H.E. Mr. Abdul Mahdi, Prime Minister of Iraq.